Light and life to all he brings. It’s easy to gloss over this quiet line in the third verse of “Hark! the Herald Angels Sing.” But to a mommy who feels overwhelmed, where everything feels a bit like death and darkness, it brings freedom. Ok, death and darkness is a bit dramatic, but you’ve had those days, right? Those days when everything you do gets immediately undone. A day when your exhausted mind can barely think straight to keep your little humans alive. Days when motherhood feels utterly impossible, but moms don’t get sick days and definitely not mental health days, so you gather all your scattered wits and slog through. Days and days when all you can feel is failure. Those dark days that toll the death of all our best laid plans for motherhood. Then Christmas comes and everything is supposed to be all light and life, but you don’t feel that way. You feel overworked and overwhelmed and just over all of it with motherhood. I get it, Mommy, I do. When I was pregnant with my first baby, I had a good plan. It wasn’t to be the perfect mom, but to be a good mom. Then my first baby came like a roaring fire, burning all my lists of good mom plans to ash. Instead of clinging to God, I strived. So God gave me two more boys, thirteen months apart, for a total of three baby boys in three years. It wasn’t just challenging; it was impossible. I wasn’t capable enough to keep them properly fed and clothed on my limited sleep and even more limited mental energy. We were all drowning on my watch. God brought me past the end of my rope and into his powerful arms through a simple promise of his sufficient grace and my weakness made perfect in his strength. God didn’t want my imperfect human abilities. In my abundant weaknesses, God’s power would be made perfect. Alone I am insufficient for the job of motherhood, but God’s grace is all-sufficient for what he has called me to do. Our world tells us that we are enough. Christian culture tells us that God won’t give us anything we can’t handle. I’ve found that God makes a habit of giving us more than we can handle, that we may recognize that he is enough, so we don’t have to be. When we accept the good news—the truth of the gospel that Jesus came to earth to be enough, to meet God’s perfect standards with his perfect life and redeem our imperfections by the sacrifice of his blood—we become free to live firmly in the grace of God. God's grace is two-fold: it both saves us from our failure before God and empowers us for life. Just as “Hark! The Herald Angels Sings” asserts that Jesus came to bring light and life, 2 Peter 1:3 promises that God’s power provides all we need for life and godliness. When every day feels like one of those days that is just too much for your abilities, God’s grace awaits to give you the power you need for life. How do we access this power to survive the stress of our everyday lives? 2 Peter 1:3 explains that it comes from a knowledge of God, his glory, and his excellence. As our bodies care for our children and our minds race through all the ways we are imperfect and unable, God is calling us to life. This life comes not from our own circumstances, but from knowing that God is great, he is kind, he loves us perfectly, and that he wants to fill us with the power to live in his grace in our present circumstances. God’s grace doesn’t stop there. It gives us everything we need for the challenges of mom life, plus all the grace we need to be godly in this midst of it. When you feel like you can’t make it through your day without anger, anxiety, impatience, or pride, God offers his grace to cover your past sins and to transform your hearts with his holiness. God does not want you to suffocate in the grip of sin, but to live in the freedom that Jesus came to earth to purchase for you. Jesus humbled himself to live perfectly on earth so that we may be freed from the darkness in our own hearts. Jesus shed his blood to cover our failure upon failure, and to empower us to live free from the grip of sin by his power. Jesus offers this glorious sanctification as a light in the darkness of our own sin. Light and life to all he brings, Dear Mommy. You’ll find everything you need for life and godliness by making knowing God a priority. When you feel completely incapable to do the mundane or momentous moments of motherhood, you have stumbled into the beginning of God’s grace. He exchanges your weakness for his strength, your imperfections for his perfect life, your not-enough for his complete sufficiency. All you must do is stop focusing on your failure, and discover the faithfulness of God. What motherhood task makes you feel insufficient for this calling? Do you find yourself needing more of God’s grace for life or his grace for godliness? How does the coming of Christ change the way that you respond to feelings of powerlessness and defeat? What is one practical way you could refocus your heart on God’s greatness and goodness when you are overwhelmed by your circumstances? When I'm used to running a 5k of motherhood every day, and suddenly get thrown into a half-marathon, I must adjust my pace. When Daddy's working late, I give myself extra breathing room throughout the day. I revert to rest-when -they-rest, newborn-style living. Cross "today" off the top of my to-do list and write "tomorrow" there instead. Almost every goal I've set for myself can wait. Better to maintain a rhythm of rest than become Volcano Mommy, spewing angry mouthfuls of crushing criticism. I know enough about myself as a mom to recognize when I just need rest. So whether they are asleep or on quiet time and I know Dad's coming home late, I forget the task list and find an opportunity for physical rest. When they aren't resting I continue to maintain a slow pace for the day, forgetting the unnecessary and just being Mom. For my 3 boys, it's wrestling, tickling, or Hide and Seek after dinner. I try to do one of their favorite Dad-activities on nights he can't be home with them. It's hard for them to not see Daddy too. My husband fills a different role in their lives than I do. I can't replace Dad, but I can get outside of my box and give them a small dose of what he offers them. I'm going to get honest and say some days I nurse grudges against one or all of my children. Because as much as I talk about giving space for failure in myself and my kids, my default is always going to be expecting perfection of all of us. When I know it's going to be a long day, I have to receive extra grace from God and let it overflow to my kids. Pray for a supernatural filling of the Holy Spirit. Repeat a simple Bible verse (His divine power has granted to us all things that pertain to life and godliness, through the knowledge of him who called us to his own glory and excellence, 2 Peter 1:3). Play worship songs on my phone. He gives me new grace for every new day. There's always enough on God's table to overflow into my relationships with my kids, but I don't always eat everything He is providing. I wake up every morning with my heart focused on myself instead of God. I continue in my self-centered mindset all day until I meet with God and the Holy Spirit renews my soul again. Even if I connect with God in the morning, my prone-to-wander heart continues to revert back to sin and self throughout my day. That’s why abiding is essential. My default will always be living for myself instead of God’s glory. I can't fix this wandering-heart problem by my own power, but only by staying plugged into God throughout my day. 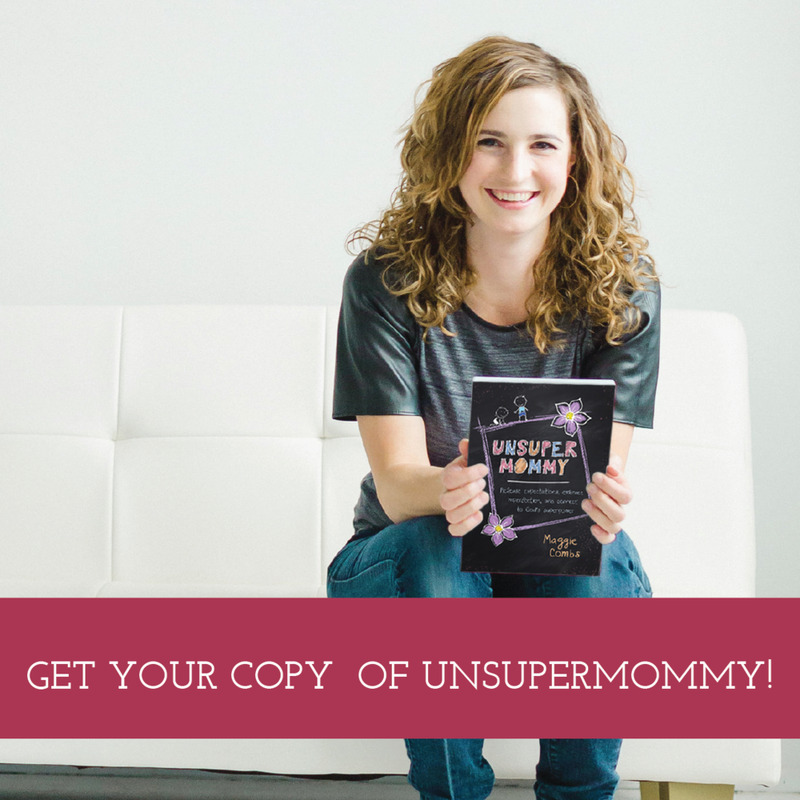 I wrote about abiding in #unsupermommybook as staying connected to God the same way we are connected to our husbands, moms, or best friends throughout our day. When I wrote the book, I was in a season so intense that my need of God was always right in front of my face. I absolutely had to stay connected or I couldn't survive my day. But as my boys have grown older, I found myself abiding less, and I missed that intimacy with God that came in the face of adversity. I prayed for a method I could use to train my brain not to forget to abide with God in a simpler season without creating an unending list of rules for my day (a legalistic stumbling block for me as a recovering rule-aholic). I didn't want to get myself into a rules over relationship mindset with God again. Make my bed: As I make my bed, I say an adapted version of the prayer that Paul Tripp says every morning. The goal is to submit myself to God's sovereignty, reorient my thinking, and reestablish my relationship with God as I naturally wake up focused upon myself. Honestly, some mornings I don't make my bed (it's a habit I'm still trying to institute), but I always pray this prayer over my son on our way to school, so I pray it for myself then too if I haven't made my bed that morning. The Prayer: Dear God, I need your help today. Please send your help my way, and give me the grace to recognize your help when it comes. Thank you for dying on the cross to free me from my sin and give me the power I need to live as a new creation. In Jesus' powerful name, amen. First Things First: I try to read the Bible first, before my kids get up, or with a kid looking at books in the chair next to me if one gets up early. On the days I don't get out of bed on time, I listen to my Bible app as I get ready, read a little as I eat breakfast if I can, then study more after we get home from taking my oldest to school. I am not above letting my little boys watch a TV show if I haven't had the opportunity to read my Bible by mid-morning. Shower: Let's get real here, silence/solitude are hard spiritual disciplines to institute--especially as a mom of young kids. Almost as hard as it is to get a shower in, am I right? On the few days a week that I do manage a shower (we won't talk about how often I wash my hair), I like to use that time for silence. It is amazing how the practice of silence helps me dig deeper into whatever spiritual truths I've been meditating on. It's also where I receive the most inspiration on what I should write next! At the kitchen sink: Anytime I find myself at my kitchen sink for more than two minutes, I try to practice my scripture memorization. I use both the "press on mama" and "grief and sorrow" cards by Words Worth Noting, and keep them tucked on the window sill behind my sink so I can't miss them while I'm standing there. In the car: We spend a lot of time in the car these days taking kids to and from two different schools, so I use my car time for a variety of ways to connect to God. Every morning I listen to the Jesus Storybook Bible on audible, discuss the story, and pray together with my boys. During the rest of the car rides I worship, meditate on the scripture I read during my morning devotions, pray, disciple/encourage friends (via voxer), and learn more about God through sermons and podcasts. Laundry: Laundry is usually a time for podcasts that help me learn more about God or apply the gospel to life and ministry, but occasionally I just take this time for prayer and silence. Disciplining and discipling my Kids: I know this is kind of strange one, but with three little boys, discipline and discipling is definitely a rhythm built-in to my day. Whenever I have the opportunity to share the gospel with them, I try to preach that same gospel to myself. When I ask them to confess, I consider what I may need to confess myself. Cleaning: This is a time to serve, not with grumbling or disdain, but to love my family with a humble heart in the same way that Jesus loved his disciples by washing their feet. Before bed: I find Christian non-fiction the perfect way to set my spirit at rest in God's provision before bed. In the night watches: When I need to get up in the middle of the night with my boys (thankfully not that often anymore), I take that opportunity to pray over my child and preach to myself the gift it is to love them in such a straightforward way. If I can be vulnerable, I look at this list and it feels like both a lot and not enough. If I do all of this in a day, I still won't even begin to discover the fullness of our glorious God. Then there's the sinful, selfish part of me that recognizes that these practices of abiding will take up time that I would love to use for reading fiction or playing games on my phone (yep, I like phone games), and this list starts to feel like way too much. And there's still more I could do. I'd like to integrate prayer more, but I haven't figured out good rhythms for different kinds of prayer yet (I'll take your suggestions, I'm currently considering praying while going to the bathroom, lol), or found a prayer resource that works well for me. But when I lean into God in these ways by the power and leading of the Holy Spirit, I never, ever regret it. I know that if you take the time to tie the practice of abiding with God into your daily rhythms, you won't regret it either. Abiding changes our lives, because it is by staying attached to the vine that we bear good fruit. Start small, just one discipline attached to one daily rhythm, and see how it draws you near to God. Once you experience intimacy with God, you can't help but want more. Remember, we're not after a list of rules, but a deeper relationship with our incredible Savior.